Today we look at the biggest selling single malt in the world, The Glenlivet 12yr Single Malt Scotch. One has to admit that you don’t get so close to the top by tasting terrible. Blandness may contribute to a certain kind of drinkability, but it’s not like success is wrought by producing dreck and begging people to drink it. You may have to concede that Glenlivet 12 is fairly decent (I know that’s hard for the experts among you). We think so as well. 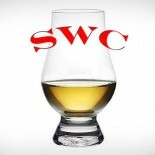 In fact, if someone were to inquire as to where they should start when it comes to single malt or even Scotch whiskey in general, this would be on the list. The Glenlivet devotes about 99% of this whisky to be aged in American oak, with the rest in sherry oak. The character of Glenlivet seems to be reluctant to allow too much sherry in the mix, as the house character of lively grain and apple notes would fall apart. The finished product is a rather delicate but still flavorful malt at a decent price. Let’s see how it does…. Nose – Light, apple notes. Flowers with peaches in the mix. Clean. Taste – Fresh. Floral with light vanilla, grain. Finish – Light char (unexpected), short length. Comment – Very drinkable, pleasant and simple. Nothing wrong with that. Mellow introduction to beginner whisky lovers.